Sautéed shrimp is an easy, quick way to prepare this tasty seafood. Add it to baked spaghetti squash, and you have a complete low-calorie delicious meal. Rosemary and lemon give the dish a fresh, bright taste. When we travel, we tend to miss out on our salads and veggies. We make sandwiches for lunch, and when we stop for the night, we order a delivered pizza. After riding in the car for 10 to 12 hours, the last thing we want to do is drive to a restaurant. Occasionally, the pizza place will offer salad, but it’s rare. Once we arrive at our destination, the first thing we do after unpacking the car is to run to the store and buy salad ingredients and fresh vegetables. Do you believe our bodies tell us what they need? Pan-seared shrimp is a fast protein option for a busy mom or dad. We’ve stir-fried it and we’ve sautéed it then tossed it with pasta. If you’re looking for a lean protein, wild-caught shrimp is ideal. Here I tell you why we choose wild-caught versus the farm-raised. For this recipe, we decide to give our sautéed shrimp an Italian flavor. We want the entire meal to be light in calories but rich in taste. We aren’t disappointed! We have our protein, sautéed shrimp. Now we need to fill out the dish. What can we add that will continue with the Italian flavor of lemon, garlic, rosemary, and tomato? The answer is simple. Spaghetti squash! First, we bake the squash in the oven. As the squash bakes, we clean the shrimp and prepare the rest of the vegetables and seasonings. We remove the spaghetti strands from the squash and put them in a casserole dish, add salt, freshly ground pepper, and a sprinkle of extra-virgin olive oil. The squash goes into the oven to keep warm (not cook). For keeping food warm, we turn the oven to 180° to 190° F.
The shrimp takes no time at all to sauté. We remove the shrimp from the pan and keep them warm in the oven along with the squash. The sliced red onion and minced garlic go in the same pan we used for the shrimp. Four minutes later we add the halved grape tomatoes, lemon juice, rosemary, and salt. Cook the ingredients 2 or 3 minutes more, until warmed through and the tomatoes release some juice. We then add the shrimp to the pan and stir. The spaghetti squash comes out from the oven and we pour the sautéed shrimp and sauce on top. We mix gently until all the ingredients combine. A sprinkle of parmesan cheese finishes the dish. This dish is simple, low-calorie, and very satisfying. We’re certain that you’ll enjoy this recipe as much as we did! 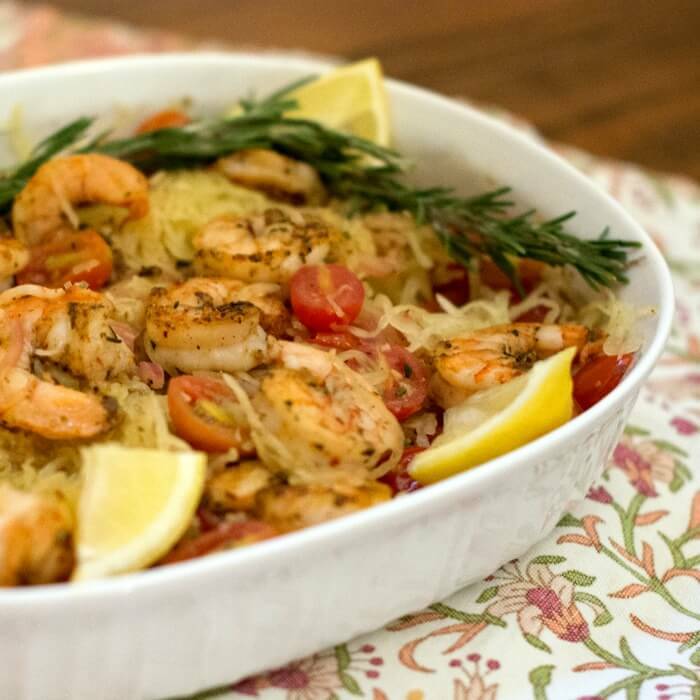 Sautéed shrimp with rosemary and tomatoes combined with spaghetti squash. A tasty low-calorie one-pan dish that will be a family favorite. 1 Spaghetti Squash about 3 lbs. Cut the spaghetti squash in half lengthwise. Scrape out and discard the seeds and membranes. Place halves, cut side down, in a large baking dish; add 1/2 cup water. Bake for 50 to 60 minutes or until tender. Remove squash from the oven. Turn cut side up and cool for 10 minutes. Season with salt and pepper and sprinkle with one teaspoon olive oil. Scrape inside of squash with a folk to remove the spaghetti-like strands and put the strands in a glass casserole. Keep warm in 180 F. oven. Return skillet to medium-high heat. Add remaining 2 teaspoons of olive oil; swirl the pan to coat. Add onion and garlic; sauté 4 minutes or until onion is tender. If the onion and garlic starts to stick, add a small amount of water or white wine. Add tomatoes, lemon juice, rosemary, and a dash of salt. Cook 2 minutes or until warmed through. Mix in the shrimp. Add the sautéed shrimp, tomatoes, and rosemary to the warm spaghetti squash. Add more salt and freshly ground pepper. Combine and serve immediately with freshly grated parmesan cheese. Be sure to sign up for our newsletter we have lots of delicious recipes coming up. It’s absolutely true that the body tells you what it needs! Mine is definitely telling me that I need some veggies after the holidays. This dish sounds wonderful! This recipe sounds delicious. I love that you use squash to keep it feeling less heavy. Rosemary and tomato goes so well together. This looks like a wonderful filling but light meal especially during the holidays when everyone is eating so many heavy dishes. I love the addition of the spaghetti squash, and speaking of traveling I think I could totally make this on vacation in a kitchenette or in my Instant Pot. Saving this one! I don’t think to eat shrimp much in the autumn and winter. I’m not sure why, it’s not like it doesn’t work, but I just don’t think of it. This recipe however gives me all the autumn and winter vibes and has me so excited to make it again and again. I love all the fantastic ingredients in it and the fun Italian flair. We’ve never made spaghetti squash with shrimp before and I can’t believe we missed out on so long. This was such a delicious dish. My husband who normally doesn’t like spaghetti squash, LOVED it. Thank you! Totally agree that our bodies know what we need….and all we have to do is listen. Good wholesome food is always a great choice and spaghetti squash is such an awesome choice rather than nutrient deficient pasta. Love how simple and nutritious this dish is. I just bought a pound of tiger shrimp, and I love this idea for a healthy, low-carb meal. I’m always looking for ways to use spaghetti squash, and this is by far, the most creative use for it that I’ve come across. I can’t wait to give this recipe a try! Yes, I absolutely believe that your body tells you what it needs — and more often than not, lightening up with vegetables is the way to go. Using the spaghetti squash in place of pasta is a great idea — to give that appearance and mouth feel without weighing you down. Since I live in South Florida, fresh Gulf shrimp is not an issue.This is exactly what I’m craving now — I can practically taste those herb laced tomatoes and squash! This looks like a delicious dinner for any night of the week. Shrimp is quick and easy to work with. Spaghetti squash it the most fun kind of all. The flavour profile is amazing. This just proves that healthy food IS delicious too. I love how easy and versatile shrimp is! I don’t think I’ve ever served it with spaghetti squash, but I LOVE that idea for some extra nutrition and deliciousness. Great recipe! Marisa this sounds like the perfect dinner I would make on a lazy weekend. Light and packed with flavors. My kids love shrimps so I’m adding this to my list of must try.. Sounds yum. Spaghetti squash is the most FUN of them all. Love the combination of delicious shrimp and squash here. This is a great dinner any night of the week. A great alternative to pasta….and so delicious. I think I will give this a try but I am planning on using scallops instead of the shrimp. Might just sprinkle in a few pepper flakes to give it just a little heat. Hi, Dennis! Sounds good to me. Scallops are delicious. Looks great,I am very fond of it. Thank you, Shrimp always make a great dish. Thank you, Rachel! I do love to cook! Let me know what kind of recipes you prefer. Thank you, Sue! Glad I could link up! I love shrimp. This looks so good. Thank you for linking up at #BloggingGrandmothersLinkParty. I’m sharing your post on social media. Thank you, Clearissa! Buona giornata! Thank you for linking up at #BloggingGrandmothersLinkParty. I’m sharing your post on social media. Thank you, Carol! Have a wonderful Sunday! This recipe looks absolutely delicious. I can’t wait to try it! You’re welcome, Donna! Thank you for your nice comments. Healthy and it looks so delicious!! Tastes so good you don’t even realize that it is low-calorie! ? YUM! A tasty and low calorie meal. Thank you Marisa for linking up at the #BloggingGrandmothersLinkParty. I shared this post. Hi, Dee! It was my pleasure to link up — thank you for hosting. Hi, Renz! This dish is so full of flavor and low in calories. You certainly won’t feel deprived. This dish looks so amazing.. full of flavors!! I have recently started cooking with spaghetti squash and I am trying to find different recipes so my family will love it.. and this recipe of yours is definitely a keeper..gonna try it soon! I really think your family will enjoy the dish, Soniya! Let me know how you like it. Thank you, Adriana! The squash and shrimp are a great combination. I really need to try cooking spaghetti squash. I have looked at the videos of how beautiful they look when cooked, but I am yet to try them. This would be a great dinner! Once you try it, Sandhya, you’ll have it again and again. It really is so good and versatile, too. Hi, Karyn! You won’t be disappointed. Hi, Karyn! 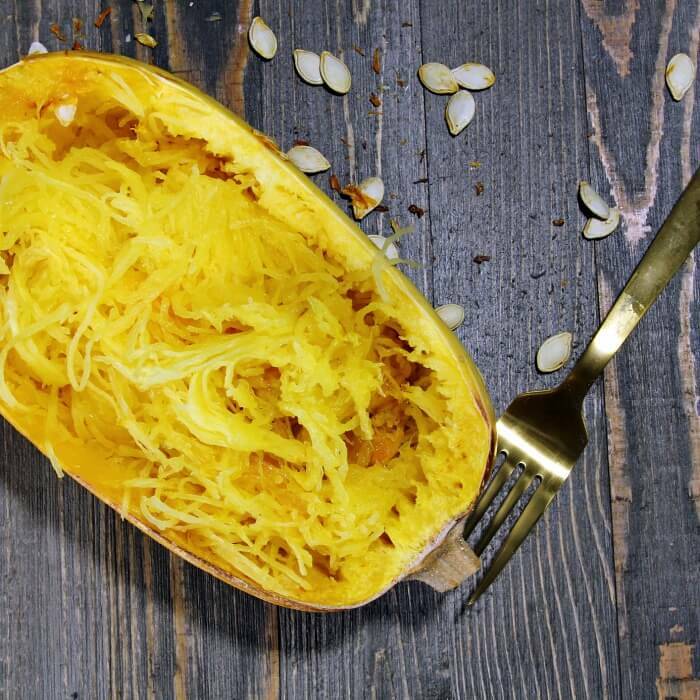 If you love pasta you’ll definitely love spaghetti squash! Hi, Susie!! We have some catching up to do! I thought of you when I made this recipe — I know how you like your veggies! Hugs to all!! This squash spaghetti is so tempting, i have never tried it, beautiful colors on the plate. I bet once you tried it, Priya, you’d want to keep using it. We love spaghetti squash — so good and versatile. I must be honest I have never tried shrimp and rosemary combination. So intrigued. Sounds amazing though. I love how super easy this is. Hi, Veena! It is an unusual combination. 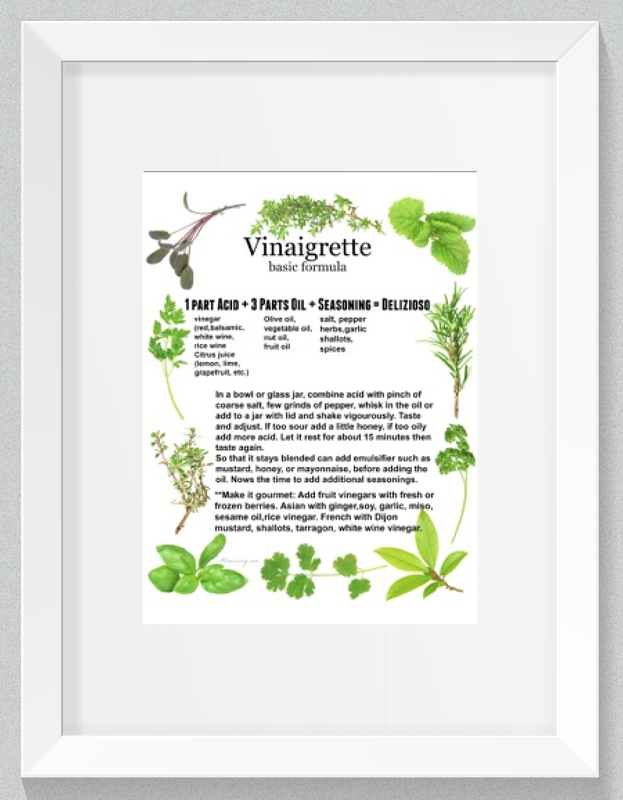 When you think of rosemary you usually see it with poultry or lamb. But in this recipe, it really works out great. These fresh ingredients look to me like the perfect summertime dinner! I love spaghetti squash and your shrimp addition looks amazing! It is really light, Jodi! Hubby and I have pasta a lot of times with our shrimp but we wanted something light that evening. The taste was so satisfying we didn’t miss the carbs. I have never tried spaghetti squash. In fact, I have been loathe to even try whole wheat pasta. After reading your recipe sounds think I will give it a try. Hi, Lisa! If you like veggies you’ll love spaghetti squash. We don’t buy whole wheat pasta. Hubby absolutely refuses to go there. He is perfectly happy with this recipe. He voted it a keeper. This looks like a very healthy and delicious meal! I actually have never used rosemary with shrimp – it’s a great idea! Hi, Julia! We think it really turned out great — we’ll use the rosemary again with fish. I love spaghetti squash and shrimp! I bet putting them together would be so good! The combination is fantastic, Madi! You’ll definitely have to try it. I haven’t made spaghetti squash in years, so glad for the reminder! I’m about to start the whole 30 diet plan. (Torturous, I tell you!) BUT I think I could eat this! Minus the parmesan, but who’s looking, right? Sounds wonderful. Keep them coming! Hi, Elizabeth! I may pull down my volume of the Whole 30 Day Diet plan. I was on a book purge and I may have donated to Good Will thinking there may be someone who really WANTS it. You’ll have to keep me informed on your progress or I can just virtually hold your hand when temptation gets too strong. After all, what are friends for?? Shame I can’t seem to find spaghetti squash in my local supermarkets, I have seen many recipes with it and looks fabulous. Those shrimps are mouth-watering, the more garlic, the better. Dinner’s sorted! What a shame, Daniela! Spaghetti squash is so versatile. It’s not in season yet so you may get it in late summer. Wish I could send you one. We have them around all year long. Sauteed shrimp and spaghetti squash is always a good idea! Love the rosemary addition to this dish! Thank you, Christine! The rosemary really gave the dish some zip!! Will be making it again soon!! I really like cooking with spaghetti squash. This recipe sounds really tasty! Shrimp are one of my favorite proteins. Hi, Pam! We are fortunate to have a direct line to wild-caught Gulf and Georgia shrimp. It is so tasty and one of our favorite proteins, also! This dish is full of flavor and color – I love shrimp and the flavors you have used and will be adding this to my list of dishes to try!! Hi, Dene’! Let me know how you like it. What a great dish Marissa. Looks so good and must make those shrimp real tasty. Enjoy your vacation. Thank you, Jovina! The shrimp were incredible! Do you say shrimp or shrimps for the plural?? I’ve heard it said many ways and I never know what’s correct. ? I don’t either but I just say shrimp. They have incredible taste here in the south. Oh this is really nice. I love the use of fresh ingredients. Beautiful pictures. Love Rosemary and tomatoes! Thank you, Crysta! I can’t believe Hubby went for it since it’s considered “low-calorie”. He loved it.